Periacetabular osteotomy is a relatively recently developed procedure. It was first performed by Prof Reinhardt Ganz of Bern, Switzerland in 1984. This is now a well-accepted operation for acetabular dysplasia and results have been very positive. Tony Dunin learned this operation under the supervision of Professor Ganz. The hip joint is a ball and socket joint consisting of the cup of the pelvis (acetabulum) and the top of the thigh bone (head of femur). Acetabular dysplasia is an underdevelopment of the hip socket where the acetabulum or cup is congenitally shallow. The periacetabular osteotomy is a surgical procedure to correct this deficiency of the hip socket. The procedure is technically demanding and should be carried out only by surgeons well trained or experienced in this procedure. Mr Dunin has performed this operation more than one hundred times and has visited Prof Ganz in Switzerland on several occasions for further training. He has also presented his results to the Australian Orthopaedic Association and the Arthroplasty Society of Australia. At a pre-operative consultation, the procedure of periacetabular osteotomy will be explained along with the potential risks and expected outcomes. This operation has reliably relieved patient’s pain in a high percentage of cases. Many patients have reported that they are able to be more active post-operatively, often returning to sporting activity. 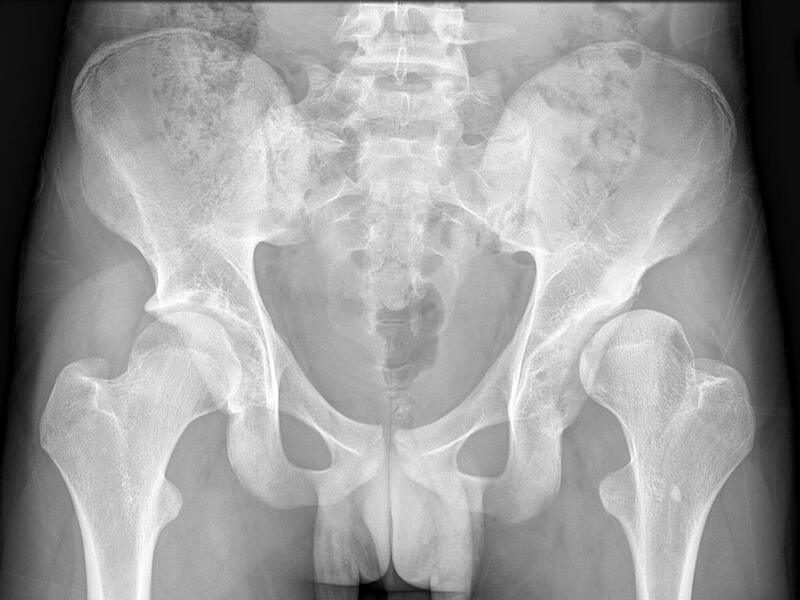 Preoperative x-ray demonstrating shallow acetabulum with uncovered femoral head. Periacetabular osteotomy involves performing several bone cuts (osteotomies) around the acetabulum and redirecting it into an optimal position so that the femoral head is adequately covered. The osteotomy is then stabilised with three screws. The x-ray demonstrates that the acetabular roof is now horizontal and there has been excellent covering of the femoral head. The procedure is a major operation with significant blood loss. A Cell Saver is used during the operation to reinfuse the patient’s own blood during the operation. The operation normally takes about two hours to perform. An image intensifier is used throughout the procedure. This is done to confirm correct positioning of the osteotomies, as well as to check for optimum positioning of the acetabulum. The procedure will be performed under a spinal anaesthetic, which numbs the pelvis and legs so that there will be no pain or sensation during the operation. Patients may also be given some sedation or a light general anaesthetic. A urinary catheter will also be inserted which will stay in position until mobility is established. As periacetabular osteotomy is a major operation, some degree of post-operative pain is to be expected. In addition to the spinal anaesthetic, pain can be well controlled by a variety of analgesic medications. Most patients are able to get out of bed between the second and fourth day. It would be expected that oral painkillers will still be required on discharge, and this is often continued for several weeks. It is important to remain minimally weight bearing for the first six weeks post-operatively. A physiotherapist will assist with the use of crutches before discharge from hospital. Most patients are discharged at approximately seven days after surgery. As this is a major procedure, it is common to feel tired in the first few weeks post-operatively and it is important to obtain plenty of rest and not expect to do too much. The leg will feel quite heavy and in most cases will need to be lifted getting in and out of chairs and cars. Four the first four weeks, regardless of which hip has undergone surgery, patients must not drive a car. When the right hip has been the site of the periacetabular osteotomy, driving should not be commenced until at least six weeks post-operatively. 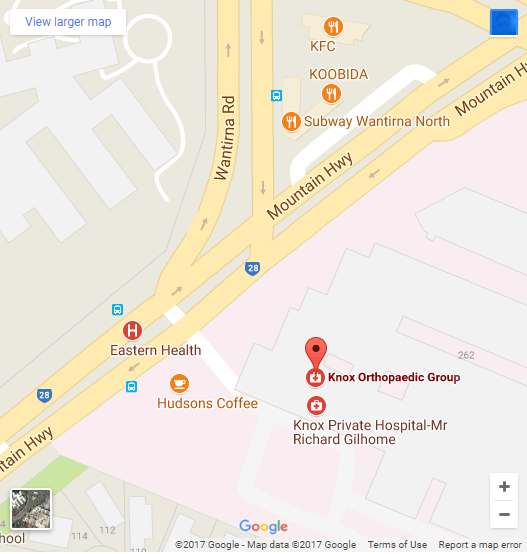 There will be a post-operative consultation at six weeks, but patients are encouraged to contact staff from Knox Orthopaedic Group if there are any concerns during the initial few weeks at home. Sometimes patients notice a clicking sensation in the groin in the first few weeks and this is normal and is usually temporary. After the six-week period, increased weight bearing will be allowed and this will progress to full weight bearing by ten weeks post-operatively. At this stage, physiotherapy and rehabilitation exercises can be commenced. Gentle stationary bike riding and hydrotherapy can also be started at this stage. It is expected that there will be a limp and some weakness in the leg for up to six months after the operation. Patients continue to improve for up to twelve months post-operatively. It is advised that sporting activities are not resumed before eight months. This is a major operation and involves some potential risks. These include the following. 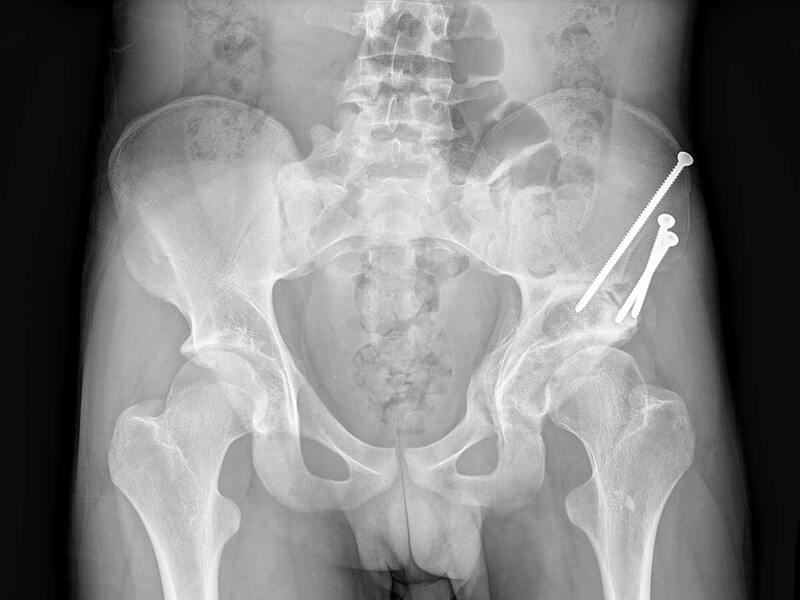 This is very uncommon for this operation due to the excellent blood supply of the hip. If it does occur, it may require antibiotic treatment or occasionally further surgery to wash out the wound. It is very common for patients to experience some numbness in the outer thigh but this does not usually interfere with the function of the leg and in most cases resolves over some months. Although great care is taken to protect the sciatic nerve during the procedure, there is a very small risk of damage to the nerve. If damage does occur, it can cause altered feeling and weakness in the foot and ankle. In most cases this improves spontaneously but there is a small risk that it could be permanent. Most studies have shown that approximately 85% of patients obtain very good pain relief. There are some patients who do have ongoing pain that may be related to the development of osteoarthritis. One of the aims of the operation is to prolong the function of the hip and to delay or prevent the need for a total hip replacement. In a small percentage of patients, osteoarthritis does develop and a total hip replacement may be required some years after the periacetabular osteotomy. There is a small risk of delayed healing of the osteotomies. It is very important that patients refrain from smoking for at least six weeks prior to surgery and for as long as possible post-operatively as smoking interferes with wound and bone healing. There is a small risk of blood clots (deep vein thrombosis) in the initial post-operative period. Patients will be given stockings to improve the blood flow in the leg and will be encouraged by the physiotherapist to exercise the foot and calves frequently. For the first two days, foot pumps will be fitted to the foot and ankle. These mechanical devices actively contract the legs to also improve the blood flow. In addition, patients will be placed on either Aspirin or blood thinners. Patients are reviewed by Mr Dunin over the next few months to assess the progress of rehabilitation and healing of the osteotomy with periodic x-rays. Periacetabular osteotomy is a major procedure and it is important for patients to take time to reflect on the pros and cons of surgery before proceeding with this operation. It is sometimes helpful to have two or more consultations with Mr Dunin regarding this decision, as there is often a lot of information to take in at one time. In addition, the staff at KOG can arrange for patients considering surgery to talk to other patients who have had this procedure. This can be helpful in gaining insight into what they are likely to experience in the post-operative period.